The BrainCert is a SaaS training platform that offers comprehensive set of educational tools that enable users to create and deliver personalized e-learning content leveraging BrainCert's next-generation products. BrainCert does the heavy lifting by intelligently delivering your content to global audience, ensuring applications are highly-available, secure, and responsive to demand. Can I use both E-Learning Platform and Enterprise LMS? Absolutely. By design, you first create an account in the E-Learning Platform. To use Enterprise LMS, you would need to go to https://www.braincert.com/lms/domain and activate your custom domain. Click here to see the difference between the E-Learning Platform and Enterprise LMS product offerings. Is data shared between the 2 platforms? No, data is not shared between the platforms. So, you will not see your video uploaded in the E-Learning Platform available in the Enterprise LMS. It is important to choose the right platform to start with to save time. How is BrainCert different when compared to the competition? So glad you asked! Most of the competitors provide an online platform that offer features such as the ability for the instructor to upload some files, create a course, and sell it using their e-commerce tools. BrainCert goes beyond just selling online courses by offering a comprehensive set of synchronous and asynchronous educational tools built in both E-Learning Platform and Enterprise LMS product offerings. The result - significant cost savings, increasing productivity, and secure, seamless and enhanced user experience across all platforms. Testing is an integral part of training. It is paramount for recognizing skills decay. Assessment should be done on a continuous basis, and BrainCert's Online Testing Platform is the perfect choice to measure, analyze, and view results of the test takers online easily. U.S. firms spent about $156 billion on employee learning in 2011, the most recent data available, according to the American Society for Training and Development. But with little practical follow-up or meaningful assessments, some 90% of new skills are lost within a year, some research suggests. A soup-to-nuts solution for students and instructors, BrainCert offer tools to deliver interactive and blended courses online using the Courses Platform. With BrainCert's powerful course creation tools, you can easily create, manage and publish the course in just a few clicks. Finally, BrainCert integrates seamlessly with PayPal and Stripe to sell your tests, courses, and live classes for faster revenue. Data security is of utmost importance to us - all our traffic is done over SSL, the web standard for secure data transmission, and files are protected by policies and security controls and stored with top-grade secured infrastructure. Furthermore, your video and audio files are protected using signed URLs which are time based tokens that are only valid for a limited period of time. Once that time window has expired, the access token contained in the link will no longer work. BrainCert has been awarded the Skyhigh CloudTrust rating of enterprise-ready for its cloud-based online training platform. 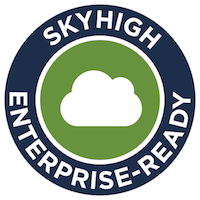 Skyhigh Enterprise-Ready cloud services are the select cloud services that fully satisfy the most stringent requirements for data protection, identity verification, service security, business practices, and legal protection. BrainCert has achieved Standard Technology Partner status in the Amazon Web Services (AWS) Partner Network (APN). BrainCert has achieved this recognition by meeting the strict quality standards of Amazon Web Service (AWS). AWS is a perfect enabler for BrainCert's global expansion and its unparalleled reliability, scalability and security, a key element of trust for our customers.